SoccerSam.com: How did you get into soccer? Danny Kramer: I started playing in the local leagues when I was 4 and seemed to be a natural at it. I kept playing and when I was 13 and made the Eastern New York ODP team, I thought I might have a future playing soccer. I decided then to dedicate myself to playing and trying to play in college. SS.com: Who was your biggest soccer influence growing up? DK: The biggest soccer influence I had growing up was the different coaches I had for the different club teams I played for. There wasn't one specific person. The biggest influence on my soccer career through college was Declan McShefferey. He has trained me and made me a better player through my four years of college and I owe a lot of my success to him. SS.com: What player do you try and model your game after? DK: I don't model my game after anyone. Some people say that I play like Chris Armas, which is an honor. He actually trained my club team in Plainview when I was 11 years old. SS.com: What was your best moment of your pre-Duke soccer career? DK: When I was 13 my club team went to France to play in the Paris Cup. We were in the finals against France in front of a big crowd. We were down 1-0 with 2 minutes left. I was playing sweeper and got the ball in our box. Beat a few players, did a few give and goes and then hit a strike from 20 yards out that bent upper 90 with 30 seconds left to send the game into overtime. We won in a shootout, which I scored in also. SS.com: What was your favorite soccer team growing up? SS.com: Is Duke's men's soccer team as hated by opposing teams as the men's basketball team? DK: Not as much as the basketball team, but teams definitely don't like us and always come out real hard when they play us. No matter who it is, they come out like it is a war. SS.com: What was the bigger rival - North Carolina or NC State? 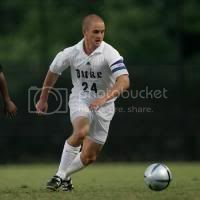 SS.com: How did you grow as a soccer player at Duke? DK: I definitely enhanced my skill level at Duke. My touch improved dramatically over the four years and my ability to use both feet helped me play all over the field and made me harder to defend. Also, I developed a knack to put myself in good spots to score goals. SS.com: What was the best moment of your Duke career? DK: When we beat UNC in the 2005 season in the ACC Championship. After 3 years of not making it passed the 1st round of the ACC tournament; to beat UNC in the Championship was the best way to do it. SS.com: What are you doing to get ready for training camp? DK: Just trying to stay as fit as possible and play as much as I can to be ready for preseason. SS.com: The Rhinos played a lot of 4-4-2 last season. Where in a 4-4-2 do you feel you fit in best? DK: In a 4-4-2 I'd probably fit in the best as an outside midfielder on either side. I could also play outside back or forward. SS.com: Veteran defender Scott Schweitzer is an NC State grad. Are you concerned at all about what he might do to a rookie from Duke? DK: I'm hoping he won't be too hard on me. At least I didn't go to UNC. I think that would be worse. SS.com: The Rhinos will hope to have 14,000+ fans at the opening of PaeTec Park. What's the biggest crowd you've ever played in front of? DK: 13,000 people in the NCAA Final Four in 2004. SS.com: What goals do you have heading into camp and your rookie pro season? DK: I just hope to play the best I can and give it my all every day. I hope I can help the team in anyway they need me to and hopefully we will have a successful and winning season. Most of all, I am going to have fun playing for a great team like the Rhinos. SS.com: What do you like to do in your free time? DK: Watch sports, especially college basketball and listen to music. SS.com: What is the most embarrassing song or CD that you own? SS.com: What is your favorite TV show? SS.com: What is the ring tone on your cell phone? SS.com: What is the craziest superstition that you seen a teammate have? DK: Our sweeper this past year shaved his entire body before every game. He's crazy. SS.com: What is your favorite NBA team? SS.com: Do you pick Duke in your NCAA Tourney bracket every year and if so, will it pay off this year? DK: Yes and Yes, finally. SS.com: What are the best and worst nicknames that you've ever been given? The views and opinions expressed in this column are those of the author's, and not necessarily those of the Rochester Rhinos or SoccerSam.com. Feel free to send any comments or complaints to news@soccersam.com. James promises to read (but not to respond) to all of them.